As beekeepers discovered long ago, a single colony with two queens generally builds a large population of bees and can produce abundant excess honey. (1) The reason two queens in one large system will out produce identical queens in two separate systems, can be explained simply by the fact that a two-queen system will produce more bees, but it’s a little more subtle than just that. The first obstacle a two-queen colony must overcome is the fact that in almost all animal species there’s a fitness contest among sexually maturing individuals that determines their reproductive rights. With honey bees it’s a fight to the death when circumstances allow rival queens to meet. Therefore, the idea that two queens can exist harmoniously mixing pheromones and laying eggs, runs contrary to the natural one-queen order of a colony, but under certain conditions two-queen systems do occur. Natural two-queen systems can occur during supersedure when a daughter queen will coexisted with her failing mother, also at times when both queens are injured rendering them unable to engage in a reproductive contest. (2) The case we will discuss is an intentional manipulation where two queens contribute to the brood of a single colony but are not allowed access to each other. An important colony condition influencing how an individual bee progresses, is her frequency of encounters with the age-related task she is currently performing. In the case of a nurse bee it’s the encounters to care for brood. With lots of encounters a nurse bee is likely to follow a somewhat orderly progression to the next age-related task. 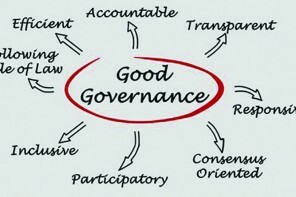 In a productive two-queen system, that orderly progression can be altered to better serve the colony. Since the colony is producing large amounts brood and also a large population of nurse bees, the slightly older nurse bee cohorts will encounter less brood in need of care. At the colony level, those older nurse bees can be hormonally triggered to bypass all the interim age-related tasks and become foragers, which is more in line with the needs of the colony. Studies have shown that nurse bees can advance to foragers at seven days of age instead of the 21-days typically associated with the age of a forager. (6) These precocious foragers can become a factor in the larger field forces that two-queen systems are known to produce. Another noted advantage of a two-queen system is that there is more queen pheromone per bee, which may reduce the tendency to swarm. One theory about swarming is that as single queen colonies grow large, the queen’s mandibular pheromone (QMP) and footprint odor, both partly responsible for suppressing the swarm urge, have difficulty circulating to bees on the far reaches of the colony’s various comb edges. Without sufficient QMP and footprint pheromone, worker bees at those locations are less informed about the queen’s fecundity and have a tendency to start queen rearing. (7,8) According to the theory, that’s one reason why we often see queen cells along the bottom edge of comb. There is science supporting this theory and also credible anecdotal accounts that populous two-queen systems tend to swarm less. Even so, a colony’s reproductive events are difficult to suppress, so observing prudent swarm management is still required. 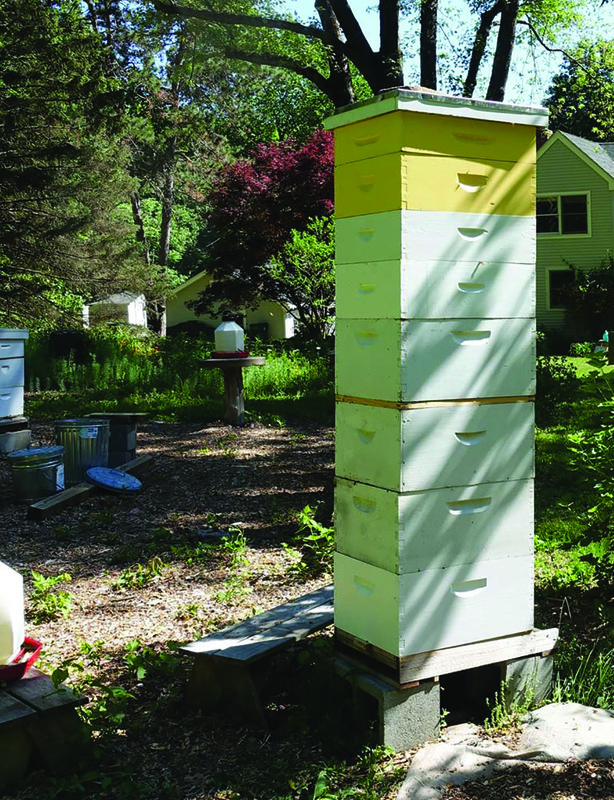 On a practical level, a few years of hefting ladder-high 90-lb deeps can convince any beekeeper to reconsider the vertical stack and look for a more workable two-queen system lower to the ground. Fortunately they exist and that’s what I’ll explain here starting with the equipment. The system I’m describing is a horizontal system in that two colonies are placed side by side so they can share a common set of supers (Figure 2). The brood chambers stay physically separate although I prefer to join the bottom boards with screws. This ensures both sets of brood chambers stay at identical heights even if the assembly is placed on a slightly uneven surface. Figure 2. A complete horizontal configuration. You’ll need two attached bottom boards, deep or medium brood boxes, two half size migratory or telescoping covers (shown), honey supers and a standard cover. Also needed is a set of full size migratory covers (not shown) and a flat queen excluder. Initially, supers are placed over a queen excluder. Some beekeepers consider the queen excluder optional. I prefer to use an excluder until harvest, and just for reference, when a queen excluder is used the systems are sometimes referred to as two-queen as opposed to being called a multiple-queen system when a queen excluder is not used. In multiple-queen systems the queens are kept caged in common brood chambers long enough for both queen’s pheromones to thoroughly circulate. At that point either queen would be accepted. But as explained in the 1913 ABC and XYZ of Bee Culture: “If both be liberated at the same time, one in one corner of the hive and the other in the opposite corner, both will be tolerated by the bees.” The author goes on to explain that this condition is tolerated as long as the honey flow continues but will most likely end in a “royal battle” when the flow stops and especially if the end flow is accompanied by robbing behavior. Conversely, the use of a queen excluder will allow the beekeeper the option to decide when, or if there will be a royal battle. The preferred excluder is flat without a raised rim because when you place a flat excluder, so it straddles both brood chambers, it eliminates the bee space on the box edges between the two colonies so the queens can’t wander over and try to kill each other. If you use a wood framed excluder, the raised rim will provide a bee space between the brood chambers and to keep the queens separate so you’ll need to add a filler strip under the wire portion of the excluder over the adjoining box edges to eliminate that space. Figure 3. 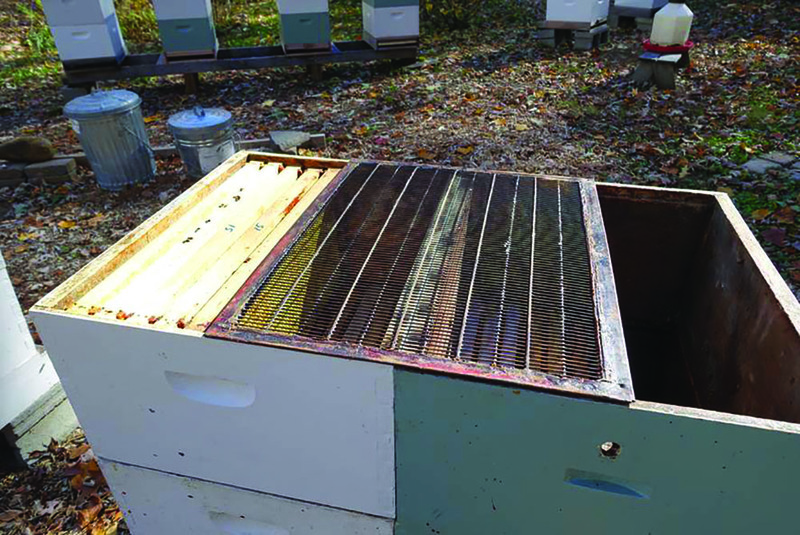 You’ll need to make two half size covers for the five frames left exposed when the honey supers are positioned in the middle of the brood chambers. These covers can be simple migratory covers or with a little more work, telescoping covers. 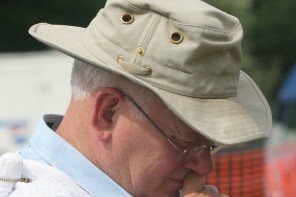 The idea is a snug fit against the honey supers to minimize rain penetration. Also visible is the flat queen excluder needed to isolate the queens. 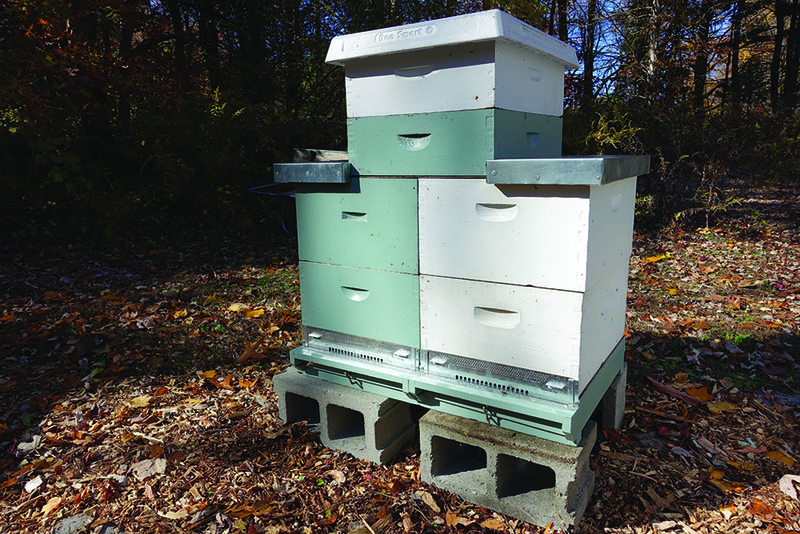 If you’re thinking about trying this configuration, you’ll need two small half covers (Figure 3) for the five frames left exposed on each colony when honey supers are stacked in the middle. They can be migratory or half telescoping covers. You’ll also need a set of full-size migratory covers for use during the spring build when there are no honey supers. In operation, the half covers should fit snuggly against the side of the supers to keep rain penetration to a minimum. That leads to the issue of the queen excluder’s thickness. A flat excluder is usually a little larger than the outside dimensions of a box. Although it’s only a fraction of an inch it will prevent a migratory cover from fitting snug against the honey super’s side. To eliminate the issue, you can add an appropriate shim or make a half size inner cover. Figure 4. This mock-up illustrates that the key manipulation in a horizontal two-queen system is to allow both brood chambers access to a single set of honey supers while isolating the queens. A flat queen excluder placed between them is all you’ll need to get it done. In operation, the frames on each side of the excluder are available for drone trapping, inspections, and manipulating brood. After the flow and harvest, a two-queen system can be dismantled or allowed to continue. That’s basically the equipment configuration so the next step is to consider startup choices. If you’re trying for increased honey production, it’s best to start a two-queen system with a strong overwintered colony that you can split early. That way you can use the parent colony for one side and immediately requeen the split for the other. Another way is to start with your own overwintered nucleus colonies, or other strong yard splits. If you chose to start with overwintering stock, it’s best to apply a broodless Varroa treatment the previous Fall, or during the Winter, so your stock is as clean as possible coming into Spring. You can also start with early packages on drawn comb and feed so they build quickly. However you decide to start, the idea is to begin about eight weeks, or more, before your main flow and manage their build so they’re ready in time with a large field force. Judging when your main flow may start on any given year is where beekeeping becomes an art based on a considerable amount of seasonal observation over a prolonged period of time. Without this knowledge, consultations with other experienced beekeepers and growers in your area are crucial. Starting on your own requires that you keep a calendar identifying your particular area’s bloom schedule by species and date. It’s an ideal method to familiarize yourself with your local bloom scape and you’ll discover many interesting secondary floral sources beyond the usual fruit blooms or dandelions. Unfortunately, the main drawback of a bloom calendar is that the bloom times are hardly reliable year to year and are dependent on many variables the most prominent being the average daily low and high temperatures in the current season also known as the growing degree-days. (12) Even with its drawbacks, your bloom calendar will help with an estimate of when to start your advanced preparations in a typical year. Most two-queen systems are used for increased honey production and if that’s the goal, it’s important to keep in mind that a two-queen system depends on both productive forage, and accurate timing of the main nectar flow. So if you decide to try one in an area with historically low nectar flows, you may not experience increased production. 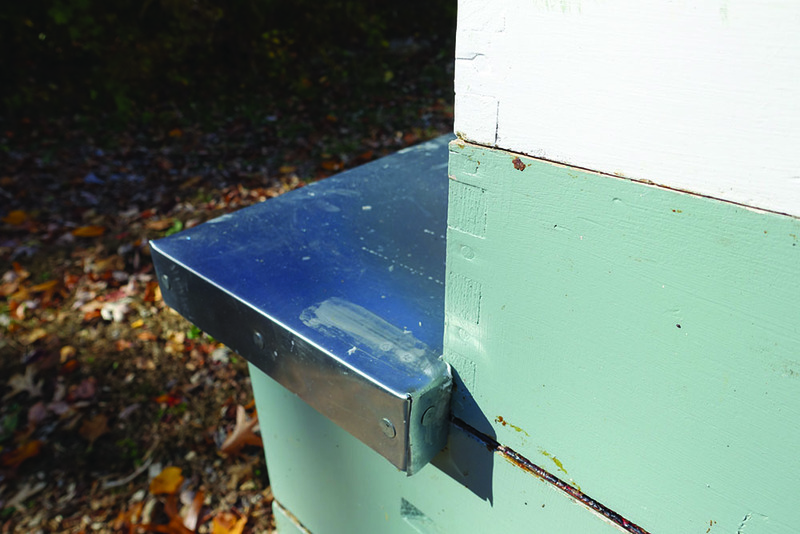 Even without increased production, since a two-queen system requires more attention to early Spring preparation, the skills you sharpen while preparing the colonies will enhance your beekeeping in the rest of your apiary. 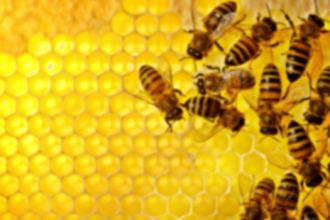 In addition to increased honey production, once mastered, your skills can be used to assist weak colonies, help manage swarming, facilitate requeening, and help when making new colonies. On a more personal level, more than any other system a two-queen system can broaden your understanding of your area’s floral sources and bloom schedule. Once you begin to yoke floral sources to observation of how the biology of your colony is effected, you’re on the way to a more complete understanding of beekeeping as art. 1. Farrar, CL 1953 Two queen colony management. Bee World 34 (10): 189-194. 2. Zheng, Huo-Qing, et al. “Sustainable multiple queen colonies of honey bees, Apis mellifera ligustica.” Journal of apicultural research 48.4 (2009): 284-289. 3. Danka, Robert G., and Norman E. Gary. “Estimating foraging populations of honey bees (Hymenoptera: Apidae) from individual colonies.” Journal of economic entomology 80.2 (1987): 544-547. 4. Donaldson-Matasci, Matina C., Gloria DeGrandi-Hoffman, and Anna Dornhaus. “Bigger is better: honeybee colonies as distributed information-gathering systems.” Animal behaviour 85.3 (2013): 585-592. 8. Lensky, Yaacov, and Yossi Slabezki. “The inhibiting effect of the queen bee (Apis mellifera L.) foot-print pheromone on the construction of swarming queen cups.” Journal of Insect Physiology 27.5 (1981): 313-323. 10. 1946. Two-queen vs. single-queen colony management. Gleanings Bee Cult. 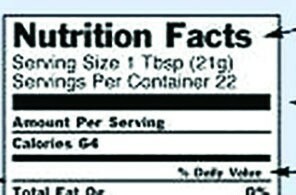 64(10): 593-596. 11. As an interesting side note, an inventive beekeeper filed a US Patent on a system including a device he named a “beeway-isolator”. The beeway–isolator addresses the issue of bee mobility in a horizontal two-queen configuration by allowing bees direct access to all four brood boxes while excluding the queen to a single set. Unfortunately, it never came to market, but the plans are included in the patent. 12. Flottum, Kim. “The Backyard Beekeeper’s Honey Handbook: A Guide to Creating, Harvesting, and Baking with Natural Honeys”. Crestline Books, 2009.